Take your time. Stretch out your packing time over several weeks. 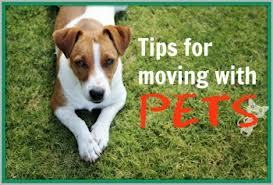 Avoid panic in the last days, leaving moving day as relaxed as possible for you and your pets. Make travel arrangements. If your move involves air travel, contact airline carriers one month in advance. Ask about their pet regulations, and make reservations. Choose a nonstop flight to avoid extra handling and climate and air-pressure changes. Visit your veterinarian. A couple weeks before moving, request a copy of veterinary records, a rabies vaccination certificate, and a health certificate. Be sure your pets are up to date with their shots. If your pet is a senior or has health problems, ask whether a mild sedative would be advisable before travel. Can your vet recommend another in your new location? For out-of-state moves, contact the State Department of Animal Husbandry or the state veterinarian about entry regulations, almost all states have entry laws for most animals except tropical fish. Don't change much... Keep your pets' routines, such as feedings and walks, as normal as possible in the week before moving. Because dogs and cats need to feel in control, they might exhibit behavioral changes or even become ill when stressed. Treat them with the same level of attention you would ordinarily give them. Make a pet room. A few days before moving, choose a small room to be the "pet room." Tape a sign to the door that says "Pets: Do Not Open." Make the sign large enough that friends or movers can see it easily. Move food and water bowls, as well as toys, into this room. Provide dogs and cats with sturdy carriers equipped with litterbox (for cats), chew toys, or favorite objects that have a familiar smell. Leave carrier doors open so pets can adapt to them before travel day. On moving day, keep animals in their carriers. As an alternative, consider boarding dogs and cats, or ask a friend or family member to care-take your dogs during the last few days. Get tags and leashes. If you have a dog or an indoor/outdoor cat, buy or create identification tags with your new address and phone number. Be sure your pets are wearing them during travel. More information on traveling tips for pets. And finally is your pet travel ready? If you're traveling by car, keep cats and dogs in carriers large enough to accommodate food and water bowls plus a small litterbox for Fluffy. Stop about every two hours to give larger pets some fresh air. Be sure to use a leash if you let your cat out. Maintain a comfortable car temperature for all pets, and don't ever leave animals alone in a car on a hot day. Even with the windows cracked, this can be fatal. Birds and other small pets (hamsters, guinea pigs, and the like) are especially susceptible to drafts and heat. Cover cages to keep animals calm and well protected, and remove water bottles except during rest-stop water breaks.